I’ve purposely left out quantities on this recipe because I have no clue how much I used as I made a “mix” of meat filled calzones and vegetarian ones. Make your Whole Wheat Dough. I made mine the previous day, stored in the fridge until the next night when I was ready to use. Roll out the dough using a rolling pin coated with a sprinkle or two of flour. You will have to experiment on the size you want your dough. It really helps to roll it out as thin as you can. 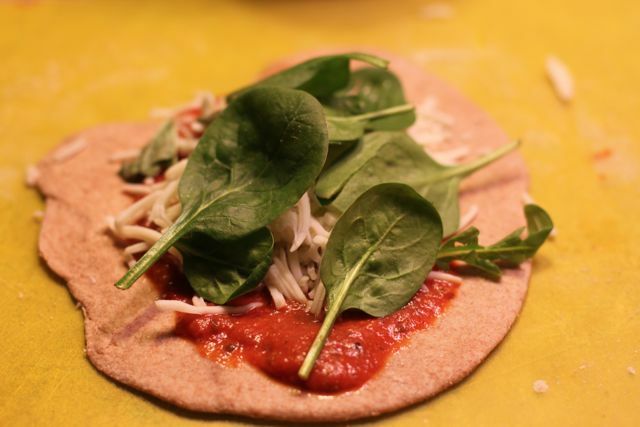 Put some sauce to your taste on the rolled out dough, add a few spinach leaves and 2-3 basil leaves, and mozzarella cheese. Fold up into a calzone…I basically roll it like a burrito. Sometimes they don’t end up that great looking but they are still tasty! The main issue is you don’t want them overflowing. Use a pastry brush to apply the canola oil. Sprinkle a bit of the Parmesan-Romano cheese. Cook at 375 for 10-15 minutes. I only made myself one vegetarian calzone and I totally regretted it. I can’t wait to make this recipe again as it was filling and delicious. I love spinach and fresh basil leaves are a new favorite of mine. This recipe was great. After cooking flash freeze several on a baking sheet. Then you can store in your freeze in a gallon ziploc bag. Warm up in the oven or microwave. The kids (except Eli) enjoyed the meaty versions I made of this. Basically, I omitted the basil and spinach and added pepperoni. If you have any questions about the vegetarian lifestyle, you can read more about it at GoVeg.com. They offer a free starter kit. I eat GF, but think i will try your meatless one. I previously owned a sub shop,and made lots of them with meat, but I really don’t eat much meat ! this sounds really yummy! I’ll have to give it a try. Have you tried the Six O’Clock Scramble. She offers a lot of healthy (and kid friendly) meatless recipes in her cookbooks and weekly subscription service.